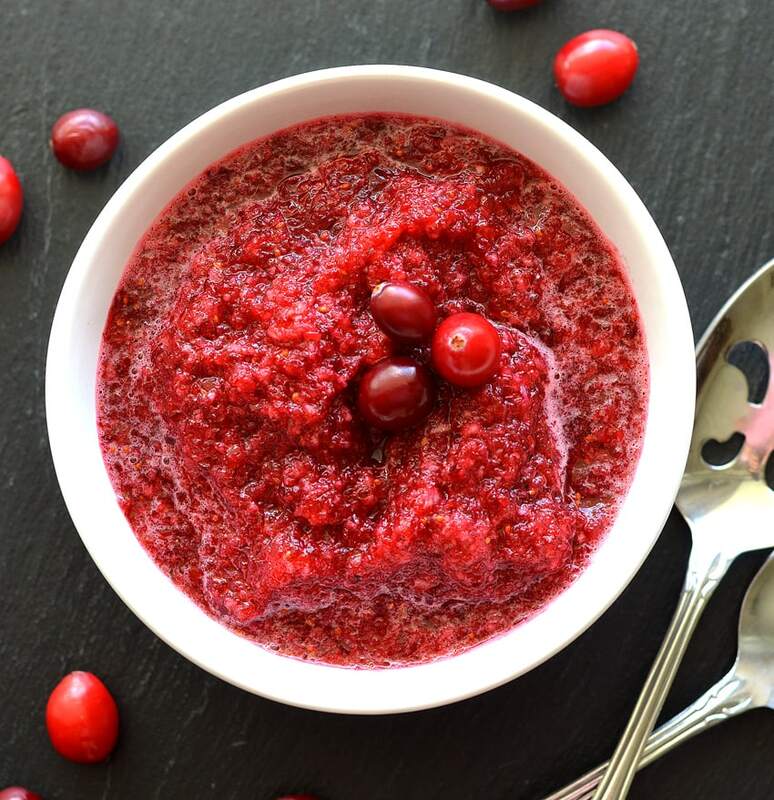 Every once in awhile, I like to give you guys a super easy, less-than-5-ingredient recipe and this Vegan Cranberry Relish is just that! Fresh cranberries, apples, sugar and an orange are all you need to create this delicious relish. I chose to make a chunky relish, but you could also let it go in the food processor until it’s smooth if you’d prefer. I like those little bits of apples in it though. Cranberry and orange are always a match made in Heaven. The sugar can be adjusted to taste. Use a little less, a little more. It is really dependent on how tart those cranberries are. For the apples, the variety is not that important. I would choose an apple for eating raw, rather than one for baking. A few quick pulses in a food processor and you are done! I like to chill the cranberry relish for a bit to allow all of the flavors to meld. It’s so yummy! TIP! During the fall months, fresh cranberries are plentiful and inexpensive so I like to buy them, place them in bags and freeze them. This way, I have them to use for muffins, cakes, etc. I can take out what I need with no waste. For an interesting use of cranberries, you might like my Cranberry Oatmeal or my new, all-time favorite dessert, this Apple Cranberry Slab Pie. I also made this pretty awesome Cranberry Christmas Wassail and from that, an even more awesome Cranberry Wassail Granita from it! There’s also my Easy Cranberry Apple Crisp and my mom’s favorite Cranberry Orange Muffins. This Cranberry Wild Rice Bread was so uniquely flavorful and one of my favorite dressings, Cranberry Orange Vinaigrette. This Cranberry Almond Streusel Christmas Cake is one we make every year! 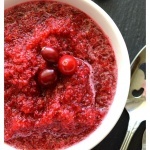 Did you make this recipe for Vegan Cranberry Relish? If so, please leave a comment below and let me know what you thought. It’s often your feedback that encourages other readers to try my recipes, so I really appreciate your input and feedback? 2 3/4 C Fresh Cranberries about 10 oz. In a food processor, add all of the ingredients pulse until finely chopped.